Inspired by the video game Assassian’s Creed, this project started life as a xiphoid retractable wrist blade, meant to be worn on the forearm. Over the course of about three hours, it progressed from a series of bottlecaps, dowels and sticks into a pinball launcher, and finally into a harpoon gun. This maker was more than happy to spend his entire visit in the shop. 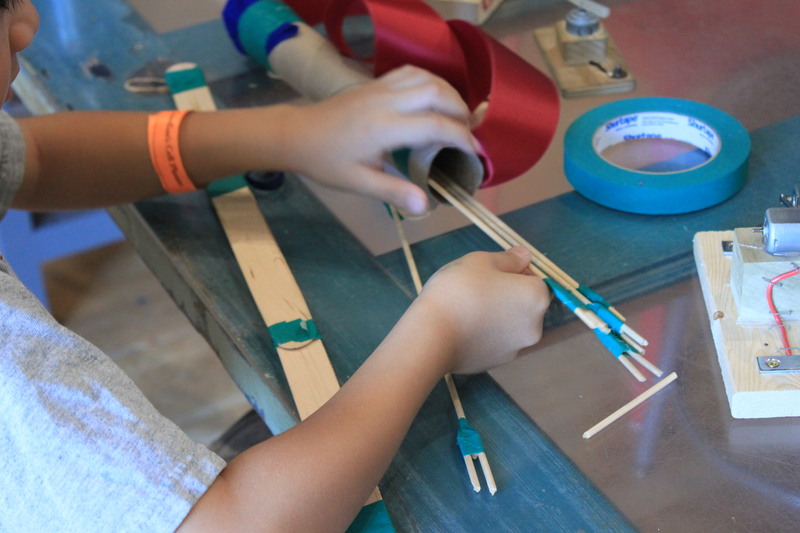 He had a lot of trouble getting everything to work smoothly, testing out rubber bands, string and elastic for the launching mechanism, and altering the support structure to keep everything moving smoothly. The grip and the moving parts had to be adjusted to prevent the whole thing from falling apart after each use. The harpoon tip was a last-minute addition before he had to leave, but I imagine he could have kept iterating for quite a while longer. Andrew has been mentioned on this blog before, as one of our regulars who will work on projects over several visits. 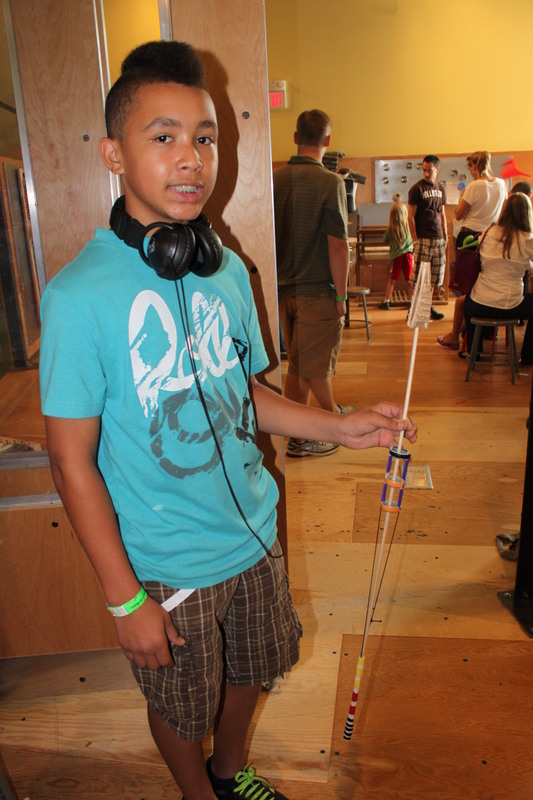 Recently he built a bow and arrow using some tongue depressors, string, tape and dowels. A bit of cardboard and ribbon served as a quiver. The first build was done on a Monday, and when the bow broke he brought it back on Tuesday to make alterations. 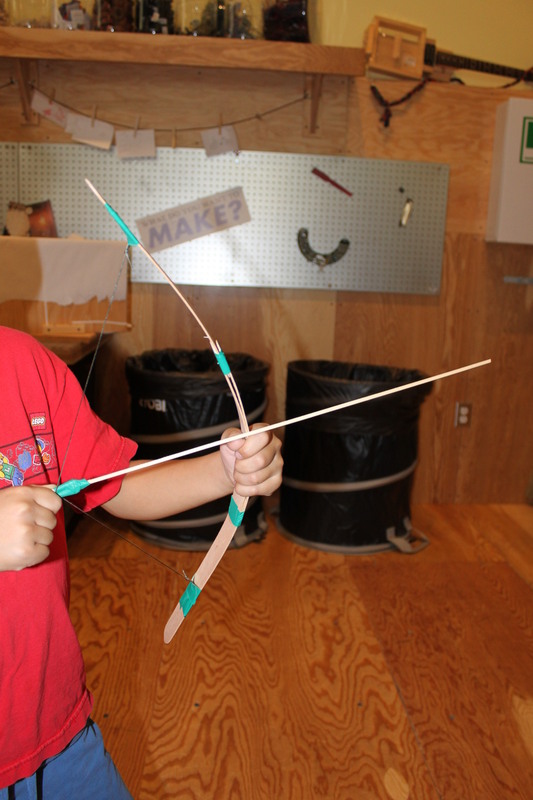 A younger visitor saw this and decided to make his own bow, but simply copied the existing design and sped through the process. 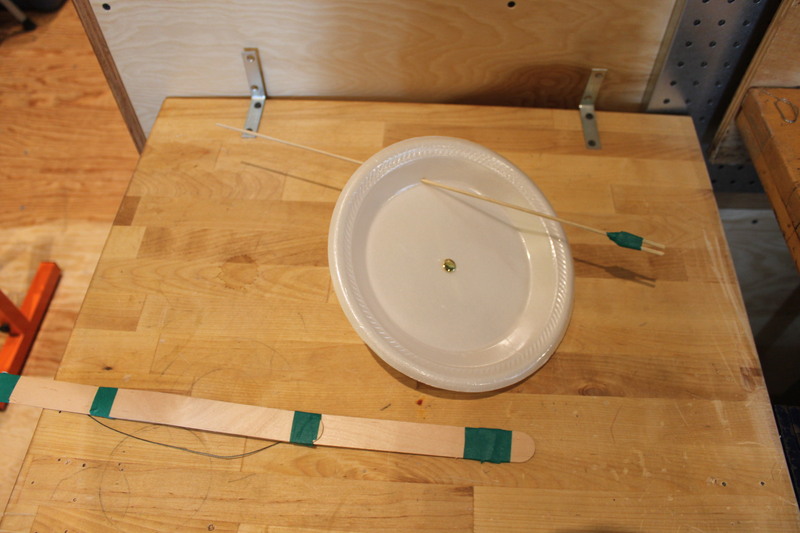 Even with such a simple project, it was very clear which version had been made with time, care and iteration; the other boy’s bow worked, but aiming was near-impossible. Andrew’s was tested and re-tested until he was happy with the mechanics. We were very firm on the “no shooting near anything alive” rule, but since there were very few visitors in the shop we were able to clear a practice range for him. I fletched one of his arrows and asked him to run some comparisons between the one with feathers and one without. He experimented with distance, accuracy, power and target-material in order to test his creation. 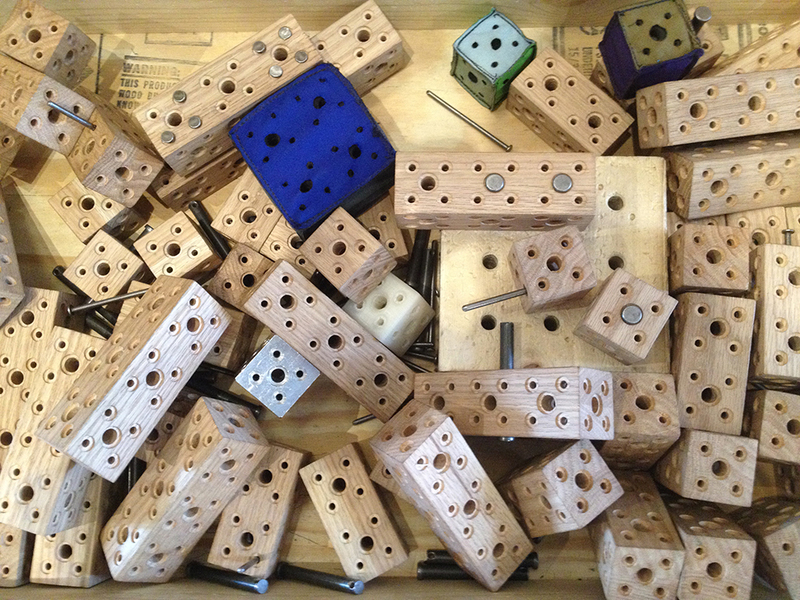 What do you do with a giant jar of extra mousetraps? If you’re Christian, one of our Teaching Artists, you build some Wolverine (of X-Men fame) inspired claws! He took the opportunity on a slow afternoon to experiment with the release mechanism to flip forward a Popsicle stick “claw”. Reportedly not the most comfortable experience, but it was still pretty cool to watch. 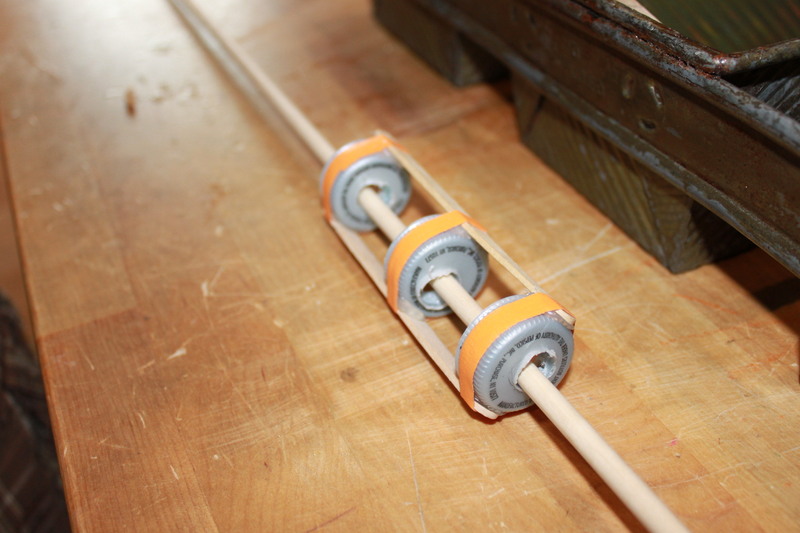 Have you built any cool gadgets with the stuff around your house? We’d love to see it! Leave us a comment or send us a photo!